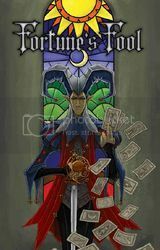 Fortune’s Fool, 2011 Judge’s Choice ENnie winner, is an innovative role-playing game that uses Tarot cards instead of dice. Set in a fantastic version of Renaissance Europe, you will play as men, elves, dwarves, goblins, and more as you adventure from the courts of Paris to the canals of Venice. Using the new Fate Twist system, you can directly alter the course of battles, social interactions, and magic spells by manipulating the Tarot deck itself. If you are looking for a Tarot RPG that delivers excitement and thrilling adventure look no further!